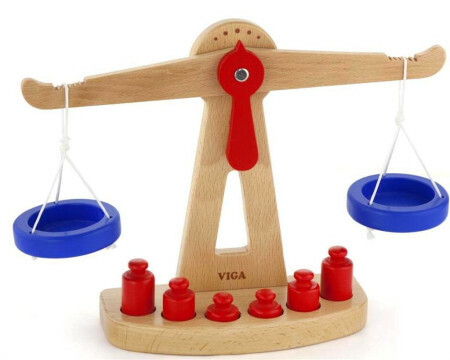 Wooden Toy Balance Weighing Scale is a wonderful wooden toy which is great for playing shop and learning about light and heavy. This working toy balance scale has two hanging trays and six different wooden weights which fit into the toys base. A sturdy cause an effect toy which is a great introduction to weights and measurement. The load trays can be moved up and down the scale arms for greater accuracy and experimentation. We like this because: "Great role-play toy endless fun weighing everything and seeing how far the arms move. "